An online retail transaction is complete only when the shipment arrives safely at the customer’s door. No amount of website design, creative marketing, and friendly personnel will matter to your customer if that customer’s order shows up mangled and broken. How Internet merchants pack an order will impact their customers’ buying experience. 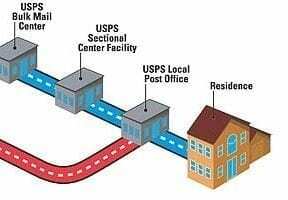 Taking the time and investing the money to properly pack an order before handing it over to a carrier like FedEx, UPS, or the United States Postal Service can save your business money (in the form of returns and refunds) and encourage loyal customers. As a general rule, your package — the bag or box you’re sending to your customer — should be able to survive a four-foot drop. Imagine holding your box about four feet above a hard concrete floor and letting it go. Boom. If you’ve ever seen the maze of conveyor belts and the army of human package handlers at just about any carrier’s sorting facility, you can understand how the occasional box will take a tumble. The products that you sell and ship will determine how carefully you’ll need to pack to pass this four-foot drop test. For example, if your online store sells t-shirts, you can quite safely pack orders in durable plastic bags without any filler or padding. But if you sell glass figurines, you’ll need significantly more cushioning. So called poly bags, which are durable, water resistant, and unlikely to tear, work well for soft goods that are not fragile. Clothing is an example of goods that may be safely sent in poly bags, or you might send stuffed animals, pillows, or similar items in these bags, too. For just about everything else, use a double-walled, corrugated cardboard box. Corrugated boxes are both strong and lightweight, making them a good choice for ecommerce fulfillment. Corrugated boxes often have “burst” and “crush” ratings. Both of these ratings may be based on pounds of pressure per square inch. If you’re shipping a box that weighs less than about 60 pounds and is not larger than a combined length, width, and depth of 85 inches, you may use cartons that have a burst rating of 200 pounds per square inch and a crush rating of at least 48 pounds per square inch. As the package’s weight or size increases, so too should the burst and crush rating of the box. Next, add filler to your double-walled corrugated cardboard box. Air-cellular cushioning, which is essentially some form of plastic bag filled with air (air pockets), is one of the best choices. Online retailers might also use foam filler, packing peanuts, or even wads of paper to fill up the empty spaces in a box and ensure that its contents don’t get tossed around. Finally, don’t skimp on tape. Use tape that is at least two inches wide. You may use pressure-sensitive plastic tape; water-activated paper tape that is at least 60-pound grade; or water-activated reinforced tape. If the products you sell are vulnerable to water damage, you may also need sealable plastic bags to wrap your items before you put them in the box. For many online stores, it will be enough to simply place items in a single, good-quality corrugated box surrounded with filler. In fact, single-box packing is the most common approach for packing non-fragile ecommerce orders. 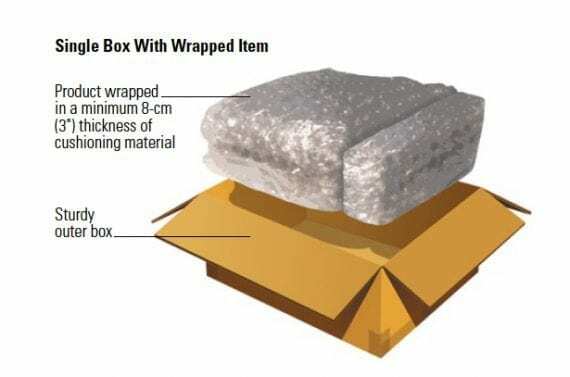 This image, which is from FedEx’s packing guide, shows a single box package with the products wrapped in bubble wrap. 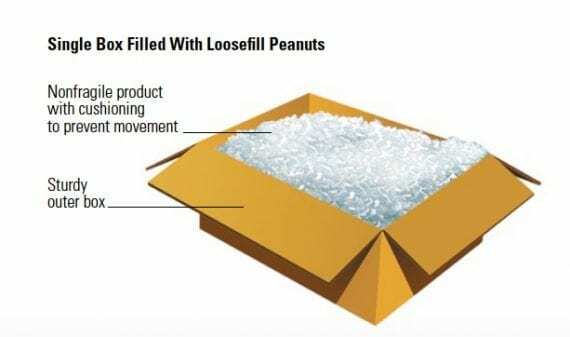 You will either wrap the items in filler like the aforementioned air-cellular cushioning or similar material, or submerge the items in loose fill, such as packing peanuts. Items may also be packed in loose fill material like packing peanuts. Again, this image is from FedEx. Close the flaps and tape every seam. Some ecommerce shipments are breakable. If you sell high-value or fragile items, you may want to double box your shipments. Double boxing adds expense both in terms of actual weight and dimensional weight. It will likely cost more to ship a double-boxed order. And it will certainly cost more in packing materials. But if it keeps the items safe and the customer happy, you should probably do it. You are quite literally placing a box in a box. The first, smaller box holds the items you’re shipping and a reasonable amount of filler. This box is then placed in a larger box with a healthy amount of filler meant to keep the small box from moving and to protect it in the event the box is dropped, crushed, or kicked. A company can sell just about anything online, including perishable foods, live plants, live animals, and much more. Hence, there are going to be some specialty items that require equally special packaging. Describing how to package fresh sushi for overnight delivery across the country is beyond the scope of this article. But for just about everything you’ll want to send there are good instructions from each of the major carriers. If you sell specialty products contact FedEx or UPS for specific recommendations. Finally, marketing should be part of your packing process too. Many successful online retailers including free gifts, candies, catalogs, coupons, and thank you notes in their shipments.